Do you have a dark place in your life? A place of heartache or even sin? Without a doubt my darkest place was when I walked away from God during my teen years. I became sexually active at a young age, and I chose to have an abortion at age 15. I found myself pregnant again—by the same boyfriend—at age 17 and the second time I chose life. From the moment after I walked out of the clinic after by abortion, I regretted it. And the pain and shame hung around my neck for many years. In 1995 I attended a post-abortion Bible study, and I found hope and healing. I walked in freedom, and I was thankful that I was able to accept God’s forgiveness and forgive myself, yet the last thing I wanted to do was dwell on what I’d done. I wanted to bury the past in the past and pretend that it hadn’t happen. Yet we know that’s impossible. The past changes us in so many ways. Not only that, but then I received the call. God ASKED me to go back to my darkest place. It all started in 1998 when my pastor approached me about starting a crisis pregnancy center. I was NOT interested. I was a full-time homeschooling mom and a part-time writer. More than that, I wanted forget my bad choices … and I didn’t want to have to revisit my decision with every client who came in. It wasn’t the answer I wanted to hear. I’ll admit it was hard going back to that dark place. I did have to share my story with others. I did have to re-live the pain again and again. Yet, each time I told my story it was easier to tell. I was also able to see the difference my story could make. God used me to help women because I had been there. I’d walked through that darkest places, and I found Jesus on the other side. As I was thinking about my darkest place, I also thought about one of the stories in my book Prayers That Changed History. It’s about St. Patrick of Ireland. Years later Patrick turned to God. He credits the Holy Spirit for showing him how to escape. He finally made it home to Britain. Can you imagine his relief to walk in freedom again? I’m sure Patrick NEVER wanted to return to Ireland, but that’s where God led him. Eventually, Patrick made it home, but he did not leave behind the memory of the people of Ireland. He continued to think about their great need for God. Patrick prayed for the people. Then one night, a dream came—one he never forgot. Patrick returned to Ireland at the age of 40. Soon many monks journeyed with him. He spent 30 years telling thousands of people about Jesus, and because of the truth that he shared Ireland was changed. Why did God send Patrick back to his darkest place? It’s the same reason why he sends us back to ours. We understand the culture and the language. We can communicate hope because we’ve been there, too. Former drug dealers can talk real with current drug dealers. Former drunkards understand the pull of a drink. Women who’ve had affairs can tell other women how to turn back to faithfulness. Women who’ve had abortions can share they pain and shame. They can also share how to find healing through Jesus. 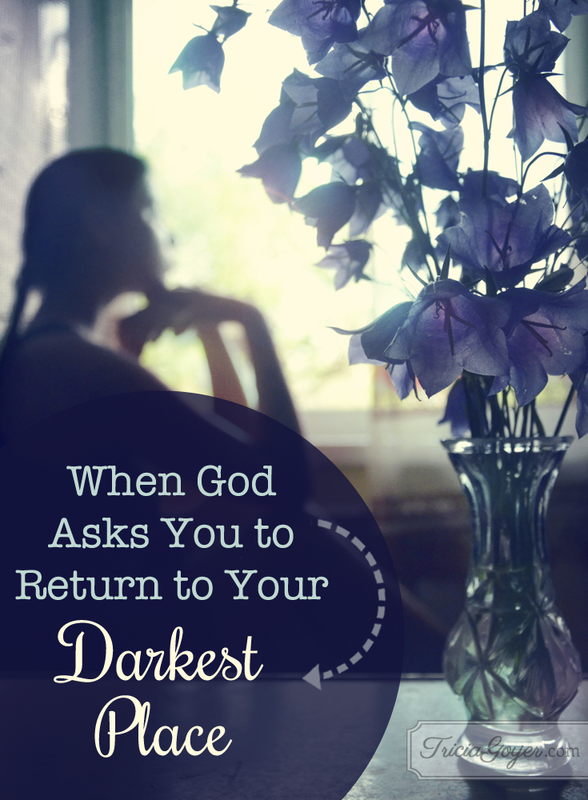 God asks us to go back to dark places not to burden us, but because there are those He wants to reach with HIS LIGHT. God doesn’t need us to have any special talents or abilities to go, we just have to be willing to show up. Because Patrick had been willing to go back to Ireland many people who lived in a pagan nation found Christ. Because I was willing to help start a crisis pregnancy center, over the years thousands of women have gotten the help they need … and hundreds of children have been born because their mothers realized that abortion wasn’t the right answer. What about you? Where is the darkest place you’ve ever been? How has God brought you out. Take a moment to ponder your story. Now, consider how you can go back to that place with the help and hope of Jesus. There are others out there waiting for you to bring them the Light! Thank you for being willing to be so obedient. It encourages me today as I am struggling to be obedient…not because I don’t want to, but because I’ve felt uncertain about what he wants me to do. I feel like he’s confirmed to me–through this post–that I need to take the next step in obedience and let him handle the details.